Michelle Thorp is Managing Director of Digital, Technology and Estates at the Department for international Trade (DIT). Her remit puts her at the front of the digital transformation taking place across the 17-month-old department. DIT offers importers, exporters, big businesses and SMEs the best access to domestic and international markets. Before she joined DIT, Michelle worked at GDS. Although our department is young, we have huge ambitions for digital transformation to bring our diverse department together and help the UK's economy. We’re getting closer to achieving these, and we recently celebrated the one year anniversary of launching our site great.gov.uk – the UK government’s single destination for information on trade and investment – which in its first year has received over 2.7 million visits. But we don’t take that for granted. We’re working hard to meet new challenges and refine our offering. 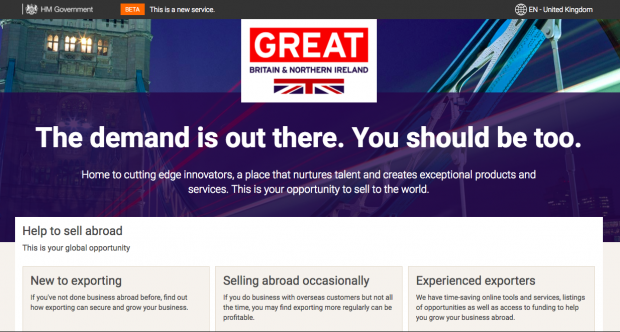 Tools on great.gov.uk such as Exporting is great', 'Find a buyer' and 'Find a supplier', and 'Selling online overseas', are extending the reach of UK businesses overseas. These services were designed, developed and delivered very quickly, thanks to Government as a Platform’s (GaaP's) common components. Digital transformation offers benefits to all users, both inside and outside of government. It can help make exporting or investing feel seamless, moving away from antiquated and bureaucratic processes to ones that are simpler and easier to use. However, identifying beneficial digital solutions and implementing them are two different things. We knew that to offer a world-leading service we’d have to find the right solutions and implement them in the right way. Having the GaaP suite of common tools, components and guidance meant that my team could draw on technical expertise and products that would have been too costly to procure independently. Creating bespoke solutions would have been time-consuming and resource-intensive. It would have limited the scope of transformation we could realistically achieve. Long periods of integration, costly maintenance and potentially being locked-in to a supplier were things we wanted to avoid. We could plan flexibly because we knew GDS had already done the technical work and there were government-built components that would meet our needs. I remember working at GDS when GaaP was really starting to take off. People were excited about what this would mean for the digital transformation of public services, and they were really optimistic. Fast forward to today and GaaP’s common components are helping DIT with over 20 transformation projects. These projects aim to make exporting and importing as frictionless as possible for users. Our department is already feeling the benefits from GOV.UK Notify and GOV.UK Platform as a Service (PaaS), and we’ll be using GOV.UK Pay soon. GOV.UK PaaS has helped us with hosting our services. Our ‘front door’ for services, great.gov.uk, is hosted on PaaS, along with several other parts of our service. PaaS allows us to scale easily and deploy applications more quickly so we spend less time on managing technical infrastructure. This, in turn, benefits our services. By using GOV.UK Notify we are keeping users of the new Overseas Market Introduction Service informed (this service helps businesses enter new overseas markets). When we start using GOV.UK Pay, users’ payments will be processed more quickly. Looking ahead into 2018, we’re investigating opening up our customer relationship management tool to other users across government for free. We recently celebrated the one year anniversary of great.gov.uk going live. We’re proud of what we’ve already accomplished and excited about what we’ll do next. We work in an agile way, meaning that we’re committed to evaluating user feedback, which we use to iterate our various digital products. As we continue our digital transformation, we know we can rely on a continually iterated, robust and intuitive suite of GaaP components, tools and guidance. I’m proud of the successes that GaaP has achieved since my time at GDS. It’s helping services across the UK in central and local government meet the evolving needs of citizens. And one year on from the launch of great.gov.uk, we’re proud of what the DIT digital team have achieved and how they’ve adopted GaaP components to build great services. You can follow Michelle and DIT, on Twitter, and subscribe to this blog for regular updates on Government as a Platform.